When you are using bathtub with hot water, it will always produce lots of steam and dampness in the surrounding of your bathroom and some time it will cause damage to your plaster or drywall walls especially if you do not have protection behind the bathtub. Some of the methods that you can use for making bathtub surround in your bathroom is by purchasing pre-formed fiberglass surrounds or even using a real tile surround that you can make yourself. Before starting to create the bathtub surround, you must make sure that all the walls are solid and gloss free. 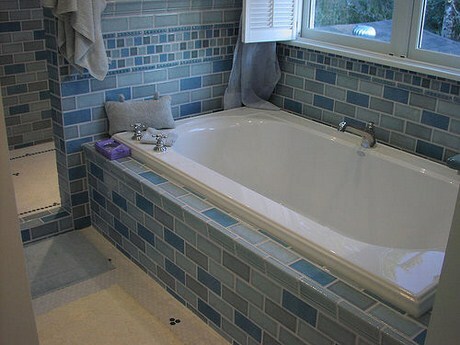 Your old bathroom can even be turned into much fresher look simply by installing a nice decorative tub surround. Below are some tips that can help you make bathtub surround on your own in the bathroom. First thing that you need to do is to place a layer of newspaper or cardboard, old blanket or even a few towels at the surface of your bathtub in order to protect it from being damage caused by falling tools or debris. Then, you have to remove the existing faucets and fixtures on the bathtub by using a wrench or screwdriver. For those of you who want to reuse back some of the faucets and fixtures, make sure that you keep them in a safe area together with all its screws and gaskets that you have disassemble from the bathtub. Remember to always wear protection such as gloves whenever you are placing the panels so that you would be able to avoid any injury to yourself. If you already have existing wall tiles or surrounds, you need to remove them also. Ensure that you manage to scrap off any mortar or adhesives after you have removed your old wall tiles or surrounds using a putty knife. If you notice any rotted or softened wood or backer, you must replace it with a new one. Remember to check for any rough, sunken, or damp areas within the area because you do not want to have any kind of those problems when you have install your new surrounds. Remember to get rid of any remains of caulking or mortar left from your old sidewalls near the bathtub. If the need arise, you also need to clean any large portion of fallen debris from the bottom of the bathtub without the need to remove the protection layer. Make sure that you create a standard guideline that can help you position the faucets correctly. You can make use of a cardboard and hold it against the wall near the area where your faucets are situated. Then, you need to create a mark right at the centre point enabling the items to stick out through the wall. After that, you can draw a circle similar to the perimeter of the faucets or handles around the centre mark. Next, take a utility knife so that you can cut out the holes in the cardboard before you place the cardboard back up against the wall. Make sure that the template that you have created is accurate and correct. The cardboard that you have cut can be use as guide for marking the holes in your actual surround. Then, you need to use your drill in order to create a starter hole. As for cutting the circle out, you can use the jig or hole saw. In order to ensure that all the pieces fit in nicely together, you have to dry fit them by placing them in the location where it will be installed. Make sure that all pieces are always plumb and level. There will always be a time where you need to trim a piece or two so that it will fit in nicely. The method used as well as tolls required will definitely vary depending on the surround that you purchased. Therefore, always refer to the instruction provided by the manufacturer of the product. The next step is to remove all the pieces that you have dried fit earlier and take note of the exact area and which one of the pieces to install first. After that you proceed to apply the necessary adhesives. When it comes to the usage of adhesives, you must always be aware of the range of time needed for your adhesive to cure completely. Then, you can attach its panels by following the instructions provided by the manufacturer of the product. In order to help secure the panels until the adhesives are properly sets, you can use tape to keep it intact. Ensure that you allow the adhesive to thoroughly dry for at least 24 hours or more depending on the product that you used. Finally, you have to re-assemble the existing faucets and fixtures or a new one back to its original position. For cleaning off any fingerprints or loose debris left after you have finished the task, you can use a dry rag to wipe them off. All seams need to be caulk and allow them to completely dry before you start to use the bathtub. The first thing that you must do is to understand all the instruction provided by the manufacturer. You should also provide an alternative bathing facility whenever you are doing maintenance on your existing bathtub for people to use. It is recommended that you have an assistant when you start to create your bathtub surround in order to finish it as soon as possible. Make sure that you have sufficient ventilation especially when you are using adhesives in your task. Always remember not to allow your children and pets to loiter around in your work area.